I went to a Meetup the other night and saw a presentation by JR Rivers (Co-founder) of Cumulus Networks. 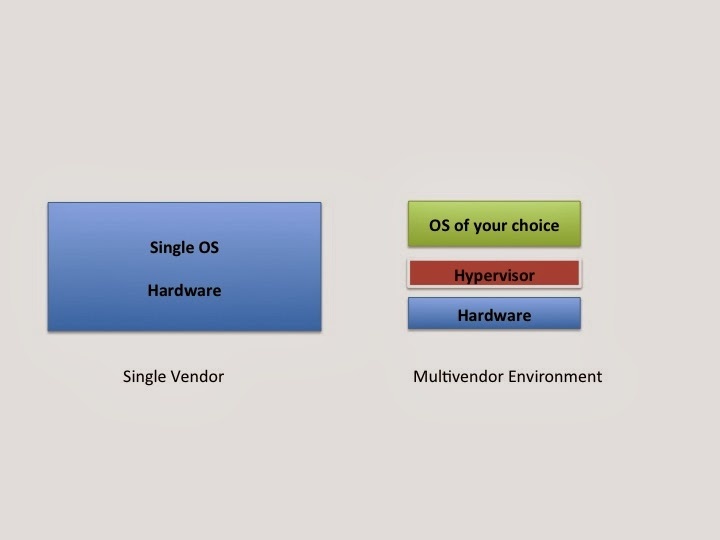 He had an interesting point that most Enterprise networks have hardware that run a single OS. For instance a customer Data Center will run Cisco hardware running Cisco IOS. As it is, the Network Admin is stuck using that vendor and cannot move to another vendor without a forklift upgrade. Who wants to reconnect links? JR's proposition is to basically take what's currently going on in the server market and redefine the networking industry. If you don't like your current vendor's OS, then you can re-image the gear and run the Network OS flavor of your choice. I can see why Cumulus has taken this approach. In order to disrupt an incumbent, you need a way to remove them from the environment without disrupting the environment. I can see this working on whitebox gear, but not really much on incumbent gear. A question from the audience was raised, who does the support? JR said that they would support software related issues. But what happens if Cumulus OS is running on top of a Cisco box? Good luck trying to call Cisco. They would automatically void the warranty in a situation like this. The one good thing about having a single vendor environment is that there is support. You know that the vendor will fix their bugs. In this new environment, you're not sure who's going to take responsibility to fix the bug. Also Cumulus is currently only targeting TOR boxes, so this unbundling of platforms will currently only happen in the Data Center. The value that Cumulus adds is that their OS is Linux. With Linux, DevOps is very familiar with this OS and can program both the APP and the network, hence the SDN part. If Cisco doesn't have a feature in IOS that you need, as a customer you have to ask for a feature request, give your SE a dollar value tied to this feature and then wait x months for the new version to come out. Of course that software upgrade costs money. As a Demo, JR showed us a BASH script that solved a problem. His point, he created the feature himself. It didn't cost him any money or require him to upgrade his OS. Now for some vendors like Cisco you could do scripting off box using screen scrapes. But other vendors already have this capability. For instance, Arista has Python built into their OS, so JR's value add doesn't really hold a lot of weight. Juniper has a scripting language called SLAX which is based on XML/XLST. A problem I see is that the OS is Linux and Security is a big problem. The reason why some vendors don't want to open up a scripting language on their box is because of this very reason. If a hacker is able to take control of your OS, they could create malicious code to do all sorts of things. I wouldn't want to be the Network Admin who has to figure out why their network is all of a sudden DDOSing their own servers and other networks. Which is why Juniper removed Perl from their early implementation of Junos and also why they support SLAX which basically prevents users from messing around with the kernel. An audience member asked about JR's take on OpenFlow. He was mostly against this. His response was that there would be lots of problems getting all the vendors to support this. This is an incorrect assumption. Networking vendors always update their OSes to support new protocols. As a vendor, you have to adapt to new things or you die. I believe JR's reluctance is the threat OpenFlow can create. A SDN controller using OpenFlow can basically take the brains out of a switch. If you have 100 switches, you basically have 100 OSes, a separate OS running on each switch. With Openflow, you can theoretically control all 100 switches with a single SDN controller and not rely on the underlying OS to do the decision making. Program the whole network, not just each individual switch. While Cumulus does make an interesting point in unbundling platforms, SDN using a controller that is able to program your whole network is way more interesting.